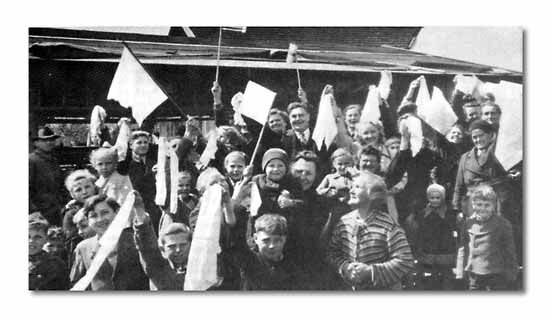 German civilians in Weilheim greeted their conquerors with cheers and white flags of surrender. Before an immediate victory over Germany could be foreseen, Allied strategists (and columnists) pointed with certainty to the mountains of Southern Germany. There, they predicted, Adolph Hitler would gather his elite SS guard for a last stand. High in his mountain retreat at Berchtesgaden, the Fuhrer might hold out for many months, possibly a year. 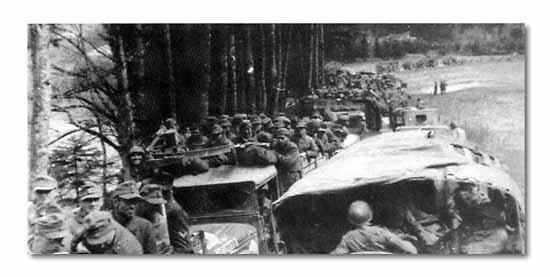 While an all-out German withdrawal to the Redoubt area would not pave the way for an Axis victory, at the same time it would impede Allied chances for a clean-cut final victory. With Allied troops trying to force the SS bands from the sharp Alpine slopes, German propaganda would have another try at splitting the Allies, and Dr. Goebbels' endless chatter might solidify heralded werewolf (sabotage) gangs into forcing the occupation forces to give up in despair. The myth of the National Redoubt was shortlived. In mid-April a double-pronged stab by the Third Army on the right and the Seventh Army on the left sliced deep into the territory previously supposed to be Hitler's invulnerable Inner Fortress. The junction of the Russians and Americans in the First Army sector farther north prevented any further transfer of enemy troops, supplies and communications to the Southern Redoubt. Captured Wehrmacht hordes, dazed by sudden realization of complete defeat, stream to the rear.